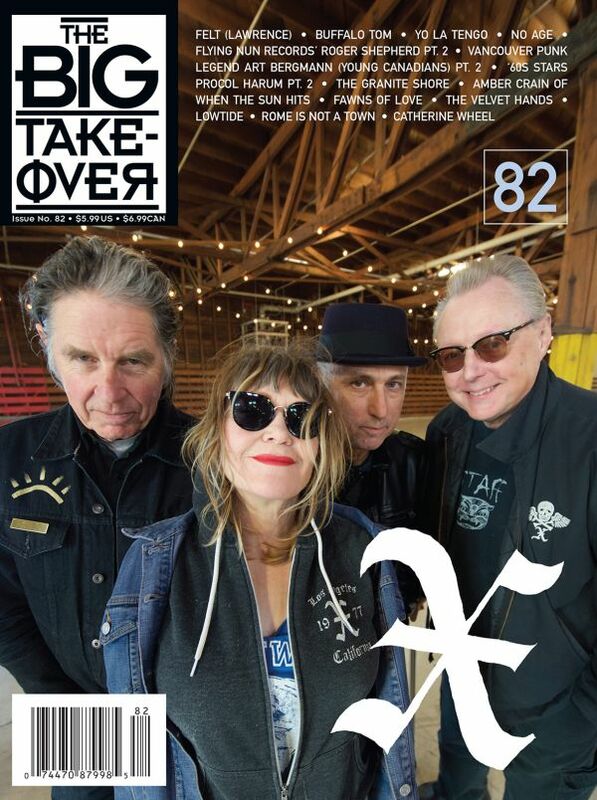 The Big Takeover: Big Takeover #82 (L.A. punk legends X cover) is shipping! (Great birthday or other Gifts! Order - Subscribe - Renew) Subscribers: Update Your Address ASAP! Big Takeover #82 (L.A. punk legends X cover) is shipping! (Great birthday or other Gifts! Order - Subscribe - Renew) Subscribers: Update Your Address ASAP! Once again the big news is that Big Takeover #82 Spring 2018 issue was completed in Brooklyn, NY and Oakland, CA this month! The issue stars 40-year Los Angeles punk/postpunk-era legends X on the cover, and features fabulous history interviews with Roger Shephard of legendary New Zealand label Flying Nun Records pt. 2, original Vancouver punk Art Bergmann from The Young Canadians pt. 2, and ’60s greats Procol Harum pt 2, plus Buffalo Tom, Yo La Tengo, No Age , and mysterious ’80s Felt frontman Lawrence. Plus there're shorter chats with The Granite Shore, Amber Crain of the web’s When the Sun Hits site, Fawns of Love, The Velvet Hands, Lowtide, Rome Is Not a Town,’90s shoegaze/dreampop greats Catherine Wheel, and more! A full description of its contents is just below! The magazine is shipping now, so you should see it quite soon! Remember, we only come out twice a year, every Spring and Fall, so you don't want to miss one of our jam-packed 150-page issues! And since the issue will soon be shipped to subscribers and stores, now is an excellent time to go to our secure online store to preorder it if you would like to receive it in the mail (you can also buy any or all of our 81 back issues there over 38 years, too! ), or subscribe if you've been meaning to, or renew your subscription if it has run out. And just a reminder that there's still time for the perfect upcoming Father’s Day or other Holiday (or whatever) gift: Big Takeover magazine subscriptions and back issues! Speaking of which, for more great such gifts, here's a reminder about our t-shirts, CDs, and our other fun stuff like Big Takeover beer cozies and signed posters--might be just the thing! That's right: Big Takeover issues, subscriptions, back issues, t-shirts in three colors, black, white, and burgundy red in thirteen sizes (including our new children's sizes, 2T, 3T, 4T, and 6MO, 12MO, and 18MO baby onesies!!!!! The coolest gift ever for the kids! ), and our accessories (BT beer cozies for only $5 and 12 X 18 color BT Anniversary Festival Posters for $4, which I will sign if you want me to! ), as well as our related CDs (including the limited edition Springhouse CD album, From Now to OK), also make the perfect birthday, Christmas (or Hanukkah, or other holiday) gifts! Especially in this time when we are all trying to economize. This means our t-shirts still come in three colors (black, white, and dark red) and are only $14 for adult men, $13 for women, and $10 for kids' shirts and baby onesies, even including postage!). And we are also offering used, good-quality CD copies of the three out of print SPRINGHOUSE CDs from 1991-1993 as well as sealed, limited edition art-package copies of Springhouse's 2008 third LP From Now to OK (see why it got an 86 in Paste! ), as well as CDs by EVEN WORSE, LAST BURNING EMBERS, DOUG GILLARD, NON-LINEAR THINKERS and EDP! 356 4th St. 2nd fl. 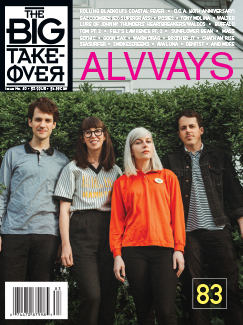 Or if you want to order just issue 82, you can send us a check (or make PayPal payment to jrabid@bigtakeover.com) for $6 to that address or order it. Hope you all buy the magazine now it's out! And/or hope you subscribe, as that is still by far the best way to support the print magazines you love if you want them to keep going. It means a lot to them! And hope you can share the gift of reading with your friends! If we can help you, let us know!